Bingo is a game of chance originally played with randomly drawn numbers (1-99) that have to be mached against numbers pre-printed on bingo cards. The game ends when first player manages to match five numbers in a row from the drawn numbers, and the winner is usually required to call out the word „Bingo!“. 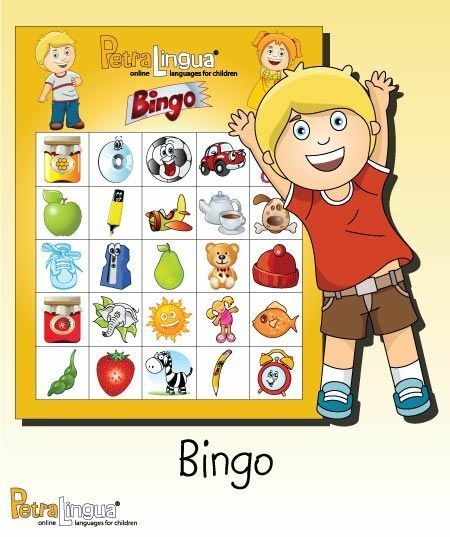 So the first theme that comes to our minds are numbers, but like other word learning games, Bingo! also offers lots of possibilities to practice the new words. For greater excitement, the whole class can be involved in the same game. If we divide the class in 2 groups, we’ll need two big Bingo! cards drawn on the (black)board or on 2 big sheets of paper on the floor. The students can participate in preparing the cards by randomly drawing the pictures in the fields of the cards according to teacher’s dictation. They get to choose themselves in which field they’ll draw each picture, with the final scope to get 2 completely different Bingo! cards. 1 student is chosen to read aloud the words. To ensure his impartiality, each word is written – or drawn – on separate peace of paper. This can also be prepared by another group of students. The pieces of paper are placed in a small bag, from which he’ll randomly draw them.